“The film “Safe Cities” deals with three people, who were unknown to each other and who came to Berlin because of different reasons, from different places and through different ways. The film shows one Turkish, one Mexican, one Syrian person engaging in a conversation that ponders on different dimensions of migration, access to the host society and the social and emotional baggage that is implied in such experiences. Through this intersubjective encounter, new questions emerge with Berlin as a material landscape of fragmented paths and contested existences. 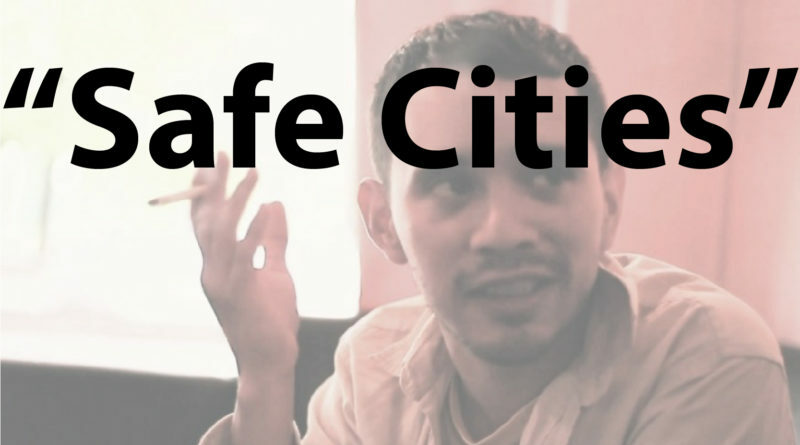 Safe Cities is a collaborative film project. It was produced in a class on ethnographic filmmaking at the Institute for Social and Cultural Anthropology, Free University Berlin. We decided to make a film about ourselves: Eli (from Syria) Zeynep (from Turkey) and me: Juan (from Mexico). The idea was originally to create portraits of ourselves based on the question of our “fears and hopes”, of what we had in common, what made us leave our cities and come to Berlin, what we were running away from and what we were expecting to find. Despite the attractiveness of the idea, Zeynep still had concerns about being filmed while talking about our personal experiences. She wasn’t sure if she was prepared enough to confront herself with intimate questions. For me it wasn’t such a problem and I thought the idea actually had a strong therapeutic potential. I argued that in any case we would be selective with the information and ways of describing things. She argued back that it was not about revealing information, but about emotions that might be hard to confront while elaborating a narrative about oneself. A narrative is in the end just one narrative, and it doesn’t do justice to one’s actual experience. The things that are left behind, forgotten on the spot, or consciously concealed might be a weight in one’s heart when events unfold and we realize we had certain fears; we were not brave or mature enough to face a certain situation; or when unfolding events reframe experiences in unpleasant ways. When giving an interview off camera, this weight may as well be easily forgotten, adjusted by memory into a more self-comforting narrative. But when a camera is recording, there is no way back: We are confronted with a greater responsibility, maybe in front of the people, but most of and before all things in front of ourselves. A couple of weeks before starting the project, I met Eli, a Syrian refugee, who became one of my closest friends in Berlin. It suddenly occurred to me that if his experience – objectively more intense than Zeynep’s and mine – could be included into our film, we could gain some interesting insights and even make the film more “relevant”. I had talked to him before we started the film project, explaining that it was part of our class at the university, but he wasn’t interested. At the time he didn’t have an apartment, was in a terribly complicated bureaucratic situation (which I could later witness directly throughout the filming process) and he didn’t consider it possible to get into a university class for which he would have to pay for public transport and invest energy he felt he didn’t have. It occurred to me that he might be interested if I just asked him to spend time with us and a camera, without him being forced to travel long distances. He accepted under the condition that he wouldn’t have to work on editing and come to long meetings to work on the concept. Another condition he set was: “don’t stick the camera in my face”. I explained to him that he could be anonymous in the film. But his problem was not about revealing his identity, or homosexuality, which was not openly talked about. When I asked him to explain his concern with having a camera “stuck upon his face”, he evaded the question by his usual “phallic remarks”. Now I suspect, although I can’t be hundred percent sure, that his concern was that of being ”objectified”, being turned into the “suffering refugee”: He had experienced enough victimization by that time already that he had to perform in front of authorities. Then there was the “second” victimization: the bureaucratic “wait–and–see” game he had to play constantly facing the job center. He probably wanted to avoid appearing in a documentary about refugees, thinking that although well intentioned, such a thing couldn’t do justice to his case, and it would rather feed some alien-sounding political debate in which he was just a number. Most of all, he felt it would do nothing to better his own situation, apart from taking some of his time. 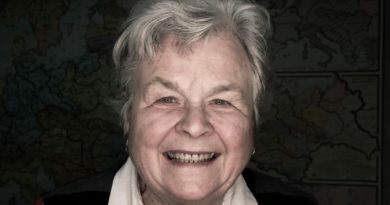 He suggested that if we had the opportunity to make a film, we should look at the wider issue of the double discrimination of gay refugees: by war and escape, and by other refugees, most of whom reproduce extremely homophobic rhetoric and practice. Zeynep’s chosen place for her portrait was her home and her neighborhood, where she felt somehow she could reproduce her lifeworld. The day we shot it, Eli couldn’t show up and we were on a tight schedule. Zeynep gave me a tour through her room and told me how different things there were filled with memories. Then she wanted to film parks and playgrounds outside the house, as well as a toy store which she said she enjoyed looking at. Eli’s experience was quite detached from the city, it was somehow “de-spatialized”. He hadn’t been able to relate to any specific place, since he had been living in Berlin for five months on borrowed money and unable to find an apartment. He was therefore crashing at the house of his ex-boyfriend. For this reason, he avoided being there too much and the unwelcoming sensation made him alienated. Aside from that, he only knew he hated Neukölln and its Arabic community to which Eli didn’t want to belong; not to mention the Job center there, to which he had to go from Moabit a couple of times a week. He refused to film in Neukölln for all these reasons. In the end, we chose Nollendorfplatz for him, where at the time he would spend some of his idle hours in bars and cafés. My meaningful place was Mauerpark: a place where a stereotypical Berlin youth culture is staged, and where I had felt a contradiction: although it tries to convey an atmosphere of complete openness and freedom, there are subtle patterns of exclusion, as it is mostly European youth that one can find here. That day we filmed with my cellphone, as we did in a demonstration in front of the Turkish embassy against Erdogan’s crackdown on the LGBT parade. Zeynep’s Turkish background and the contrast of her experience with that of other Turkish migrants and Turkish Germans would have been an interesting theme to dwell on but we did not speak about it. ← How are “animal sounds” pronounced in different languages?